Gravel Canyon is one of the great ones -­ not for the technical difficulties, but for the outstanding scenery and scattered remnants of ancient civilizations. The two short trips profiled here are a delightful taste of the delicacies available in Gravel, provoked by an interesting comment in Steve Allen's #2 guidebook. While the promised difficulties failed to materialize, the fabulous location negated any disappointment felt. The surprisingly good 2WD Cheesebox road accesses this remote area. A side canyon allows entrance to the North Fork of Gravel Canyon, which is followed to the Main Fork. We follow the canyon around, through and under several incredible boulder piles, negotiate a few obstacles, visit a nice ruin, then find a reasonable way out of the canyon and return to the car. While possible to do in one day, this also makes a nice 2 day trip, which allows for time to explore and have fun. Marking your car with a GPS will prove useful. Alternatively, from the same parking spot, hike across the top to the Middle Narrows exit, and drop into the canyon here. Hike downcanyon through some cool (and easy) narrows, then cut left up a very cool exit canyon. Eventually, the way is blocked by a dryfall. Backtracking and climbing around requires surmounting a short rock wall, 5.6, 6 feet, not scary. Hike back through the Junipers to the car. Optionally, the blocking dryfall can be rapped, revealing a cool pool and chamber. Or do both together. It takes a competent, small party about 12 hours total. This is a rarely visited and pristine wilderness canyon. Please keep it that way. Pick up any trash you find, and leave as little sign of your passage as possible. The two rappels are off natural features: keep it that way. This is a no-­bolt area. 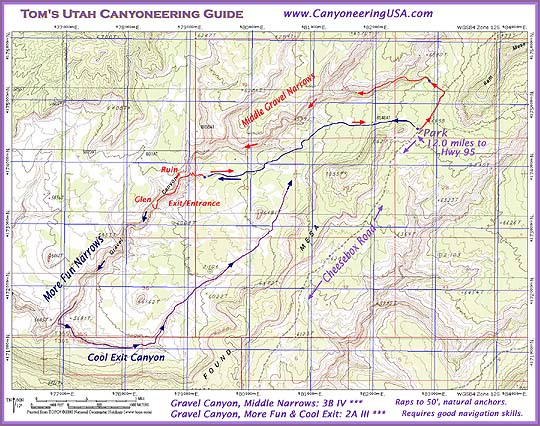 For more information on this fabulous canyon, check out Canyoneering 2, pages 158-­165. Route starts and ends at a pass on the Cheesebox Road. Narrows: 100' rope and rappelling gear; a few extra slings, dry bags for your gear. A GPS is helpful for navigation. Summer-level wetsuit will be wanted by the warm-blooded. Bring plenty. Potholes can be pumped, though water quality is not-so-hot. This is a no-bolt, natural anchor area. Anchors abound for the few short rappels. Don't bolt. High. Gravel Canyon has a fairly large collection zone above this section of narrows. Narrows: A few short rappels off of natural anchors. Two short swims. The canyon floor is often blocked by boulder piles that require strenuous scrambling to surmount, especially if hoisting a full size pack. Lower: Quite a bit of scrambling, including one short 5.6 move, not exposed. The Cheesebox Road (San Juan County Road 227a) is found off Highway 95, at milepost 66.8, 5.1 miles west of the Frye Canyon Inn. When heading east, it is 2.8 miles east of the "Jacob's Chair" sign. Follow the Cheesebox Road 12.0 miles (50 minutes) to a nondescript spot in a pinon-­juniper forest on the pass between Found Mesa and Ram Mesa, and park. 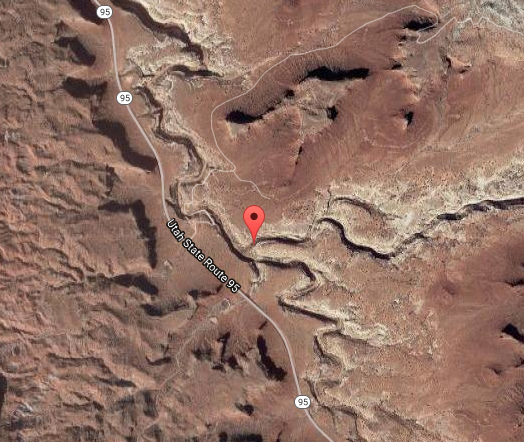 (UTM 12S 0582681mE 4174593mN) The roughest part of the road is in the first mile, where it crosses White Canyon. This is a very rough 2WD road. If you wish to camp, the first few miles of the road offer the best spots. Access to Gravel is via a small side canyon north of the pass. The entrance is near UTM 12S 0582862mE 4175370mN. Follow the road NE for a quarter of a mile, then cut into the woods. Avoid stepping on the healthy cryptogamic soil by following micro-­washes northwest toward the canyon. Find the head of the side canyon where it drops 10 feet and is choked with vegetation. Follow its north edge 100 yards to avoid the brambles, and drop in where convenient. Follow the canyon, avoiding drops with steep hiking to the sides. Eventually, a small path down the final drop leads into the North Fork of Gravel Canyon (it's about 1 hour to the North Fork). The North Fork is nice, and soon leads to the main canyon. The peculiar nature of Cedar Mesa Sandstone drops huge boulders into the bottom of the canyon, making for strenuous scrambling around, over and under. Tedious with a big pack, but great fun anyway. The tiers and winding nature of the canyon make for outstanding scenery. Follow the canyon, enjoy the scenery. The first technical problem is a 20 foot drop into a pool. A sling and rap ring on the left side, tied off to a boulder pinch, allows one to rap 30 feet to the edge of the pool. The second problem is a 20 foot drop into a slot. I lowered my pack with the rope, then downclimbed (5.6). Not much of a problem. The third problem is a 25 foot drop into a dark pool. This is an important landmark. To the right, a side canyon comes in via a short dryfall, which can be slab climbed past on the right (5.4). This leads to a beautiful round room with a 50 foot dryfall above. If you need or will need water, this is your best place to pump (water in the main canyon potholes can be too alkaline to be thirst quenching). Rappel off a slung horn 35 feet into a deep pothole, for a full floating disconnect. Swim across the pool, and squeeze through some interesting narrows. The next section of canyon offers a few interesting difficulties, but no real problems. Somewhat further downcanyon, look up -­ a nice ruin is visible 100' above the canyon floor. A few wading sections and the difficulties cease. About a mile downcanyon from the ruin, the canyon opens up into a glen, with about a half-­dozen trees. Access to both sides of the canyon is available. If overnighting, this is a good place to camp (6-­8 hours to this point). Practice proper etiquette: do not touch, climb, or take from the site. To visit the ruin, climb a weakness in the wall on the right. Work your way up and down the tiers to the vicinity of the ruin. To get to the actual ruin, go past 100 yards, and traverse in (5.4). The ruin is in good shape, though thoroughly cleaned out -­ please follow proper etiquette and be careful not to disturb the walls (1 hour round trip). The Glen is also the exit point. Notice a shallow sidecanyon coming in on the North Side, with big undercuts and some seeps. Climb with moderate difficulty through various weaknesses on the right side of the sidecanyon, to a wide slickrock bench a couple hundred feet above the canyon bottom. Traverse left (upcanyon), staying low on the bench, about 1 mile until across from the ruin. Continuing upcanyon, work your way up broken ground through the cliffbands until the top is reached. (1 hour to canyon rim). Hike left of a small red butte, and left of the escarpment behind it, to the pass and your vehicle. Easier walking can be had by staying left (1 hour back to road). Alternative Exit, probably harder: Climb with moderate difficulty through various weaknesses on the right side of the sidecanyon, to the base of the upper layer. Unfortunately, the upper layer does not allow an exit. Traverse left (upcanyon) 1/2 mile, staying as high as possible to a point opposite a corner on the opposite side of the canyon (past the alcove) to low angle slabs that allow access upward. Follow the bench back to the side canyon which allows escape to the top of the final layer (1 hour to canyon rim). When you get a view, you can see a small red butte ahead. Hike left of the butte back to your car. More fun narrows and a cool exit! Work your way down into the canyon, winding back and forth to find the easy path, until on the bench above the inner gorge. Follow the bench downcanyon about 1 mile, past the next drainage (impressive undercuts and dryfalls) then down to the canyon floor at a small glen with a few trees. (About 1 hour to rim, then 1 hour to canyon floor). Zip downcanyon. Narrows and wetness can be easily avoided by walking the benches, if desired. The canyon is delightful, especially if the weather is cool and pleasant. A variety of narrows alternates with more open areas. Follow the canyon 1.6 miles (about 1 hour), until an obvious canyon comes in on the left, shortly before the main canyon turns right to avoid the looming wall of Found Mesa. Avoid the dryfall by climbing the sand to the left. Slickrock is the start of the Cool Exit Canyon, and slickrock continues, first wide, then narrower and narrower. Excellent! Keep going. After a very cool narrows (some wading may be required), the canyon stops at a short dryfall. Climb directly, burrowing up under the boulders, or backtrack a few score of meters and climb steep dirt on canyon right. Continue upcanyon. More cool narrows soon leads to another, taller dryfall. Backtrack 50 meters or so, then climb the dirt on canyon right, to a single, steep move (5.6, on the right side of a huge boulder) allowing escape to the slickrock above. This move is not exposed, and can be boosted from below or belayed from above with a short piece of rope. Optional Stunt Rappel: the second dryfall can be rappelled off a nearby boulder, into a dark, fluted chamber and (most often) a chilly pool. Practice your ACA/CEC style Rappel Guidé so only the first victim need get soaked in the pool. Or practice your packtoss skills, and even the first person can escape a dousing. A few slings and a 200' rope will be required to set up a double rope rappel, of whatever style. Follow the drainage upstream, staying on the slickrock for easier walking as much as possible, to the end of Found Mesa and your vehicle.